A new approach to fitness software has been born. By applying both the latest scientifically proven protocols and formula alongside the extensive practical experience of our fitness experts, Your CardioGuru removes the doubt on how to use Cardio & HIIT training for sustainable and safe fat loss by giving you increased and measured fitness ability by applying our #CardioSmart targeted heart training logic to your workouts. Heart rate monitoring is the single most accurate metric to understand how your body is responding to exercise. 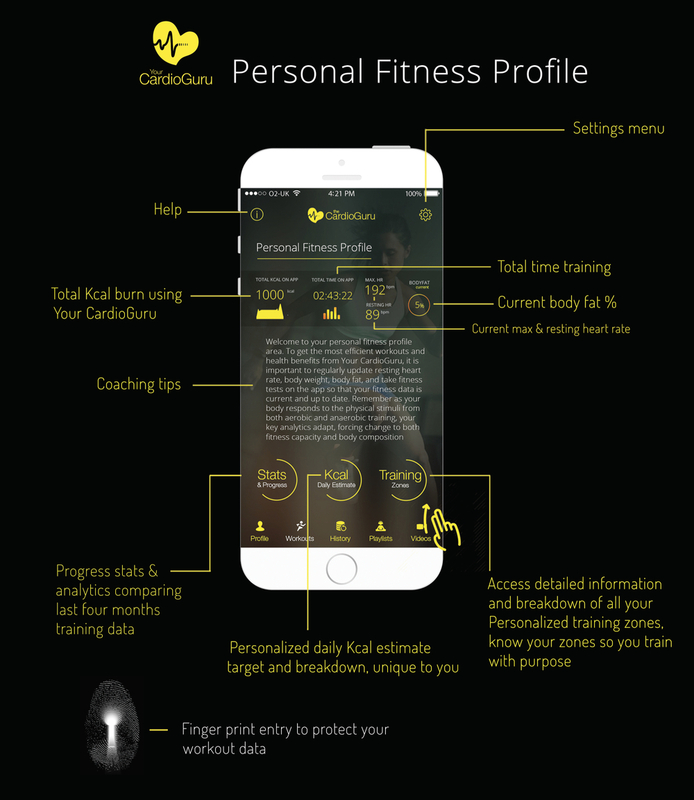 Your CardioGuru will connect with any bluetooth Heart Rate Monitor (HRM) and this is how we ensure we get accurate data about your body both in real time and by analysing targeted fitness markers that the software tracks, records, reviews and then responds to. 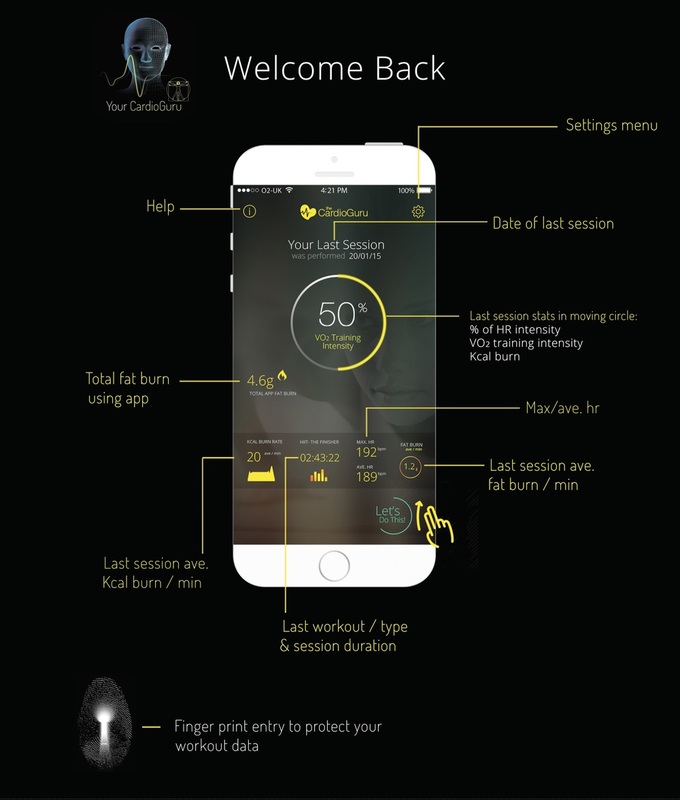 Your CardioGuru is the first fitness app to successfully dynamically code software that can intelligently set individual fitness assessments, optimal training zones and set workout targets that get harder as the user gets fitter, whilst allowing for recovery and always applying a safe approach to both training and fat loss. For the first time is it now possible to have a real training tool in an app that gives you your very own pocket coach, that can instruct you in real time, countdown each interval, track each workout, give you live, accurate performance data readings, and push you to the correct heart rate training intensity based solely upon your biometric data. It's now finally time to remove the confusion surrounding HIIT & Cardio training and help improve the training performances of both men & women of all fitness abilities. Each time you use the app you are asked core questions that effect how hard you are trained that day. Scientific in foundation & motivational in design. Every training zone is personalised to you and the data broken down. "The most innovative piece of interactive software that I have seen within the fitness industry." I have eagerly awaited the launch of the CardioGuru Fitness App. It's the most innovative piece of interactive software that I have seen within the fitness industry. It takes motivation to a new level with HIIT training and gives extensive feedback allowing constant improvement to reach your personal goals. We recommend consulting a medical professional before using the cardio guru fitness app. Fat loss & increased fitness will only occur with a balanced diet and regular exercise. Please leave your details on our mailing list and we will keep you updated with our official "App Store" release date ** This app is not yet available for download or purchase.